There is a growing need among planetary scientists to study an ice giant up close. We keep discovering ice giant size planets orbiting distant stars, but we know next to nothing about the two ice giants in our own Solar System: Uranus and Neptune. Discovery Missions: Proposals for discovery-class missions are submitted to NASA and go through a highly competitive selection process. Approved missions must cost less than $450 million (a real bargain! Well, for NASA at least). Examples include the Mars Pathfinder Mission, the MESSENGER mission to Mercury, and the Kepler Space Telescope. New Frontiers Missions: Like discovery missions, new frontiers missions go through a highly competitive selection process. Total costs (not including the launch vehicle) are capped at $1 billion. Examples include the New Horizons Mission to Pluto and the Juno Mission to Jupiter, due to arrive in 2016. Flagship Missions: Unlike the other two mission classes, there is no regular submissions process for a flagship mission. Instead, NASA develops these missions internally, with costs ranging between $2 and $4 billion. NASA tends to launch only one flagship mission per decade. Examples include the Curiosity rover on Mars, the Cassini spacecraft orbiting Saturn, and the Voyager 1 and 2 probes that are currently exploring the very edges of the Solar System. In relation to the ice giants, everyone seems to agree that a discovery-class mission could never reach Uranus or Neptune. A new frontiers mission could work, especially if it’s just a flyby mission like the recent New Horizons flyby of Pluto. But to really get up close and personal with an ice giant, we need to send an orbiter. That will be expensive, and it will require NASA to commit to a flagship mission. Upcoming flagship missions will focus on Mars (another Curiosity style rover) and Europa (potential home to alien fish). 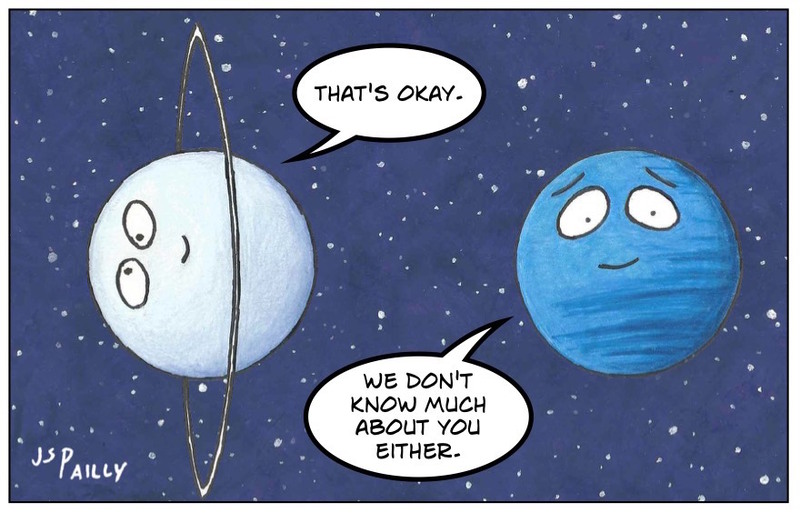 So despite the growing need among planetary scientists to study an ice giant up close, there probably won’t be a Uranus or Neptune orbiter any time soon. Posted by J.S. Pailly on November 6, 2015 in Mission to the Solar System, Neptune (2015 Mission), Sciency Words. Interesting info on the mission tiers. You have to wonder how much could be done if we didn’t have crewed missions eating so much budget. Of course, an argument can be made that it’s the crewed missions that fuel public interest enough for the robotic missions to be possible. I didn’t want to get into that in this post, but there seems to be an ongoing bitter debate in the space sciences community about that. Flagship missions, expensive as they are, cost a whole lot less than human space flight and allegedly return far more useful scientific data. Even organizations like the Planetary Society, which is generally in favor of space exploration of any kind, seem to emphasize these types of programs over human space flight. Personally, I think there’s value to human space flight too. Many of the experiments done on the ISS, for example, probably couldn’t be done with robotic satellites.